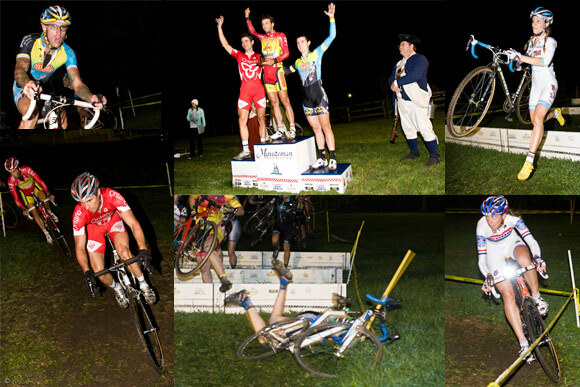 Not only was the Midnight Ride of Cyclocross the kickoff event for the New England Holy Week of Cyclocross, it was also the site of the second round of the Zanconato Single Speed Series AND the second EVER New England night cyclocross race. MRC club members turned out en force at the Lancaster Fairgrounds mid-day Wednesday to stake out the course, designed by race director Gary David. A few hours later and many of the 229 entrants were doing their course inspections on the mostly grassy, and slightly damp, terrain. Maureen Bruno-Roy turned in a great performance to gain 3rd place. There were a number of international competitors present: From Britain, there was National Champion, Helen Wyman as well as Gabby Day and Ian Fields. 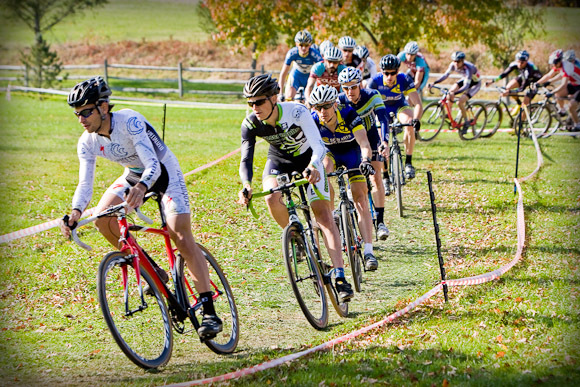 Also racing were Canadians Craig Richey (Renner Custon Cyclocross), Mike Garrigan (Lapierre Canada) and Shaun Adamson (Cycle-Smart), Belgian Tim Van Nuffel (DCM) and Dane Joachim Parbo (Challenge Tires). Crystal Anthony (Ladies First) flies down the start/finish straight. The course was laid out with the intent to provide lots of speed (2 long straightaways and high speed, triple barriers, wide and arcing turns) flavored with 3 passes through wood chip bedded barns (treacherous), a long straight uphill grind followed by a bunch of very tight, off camber switch backs and finally back up a set of stairs before returning to the tent-lined start/finish. 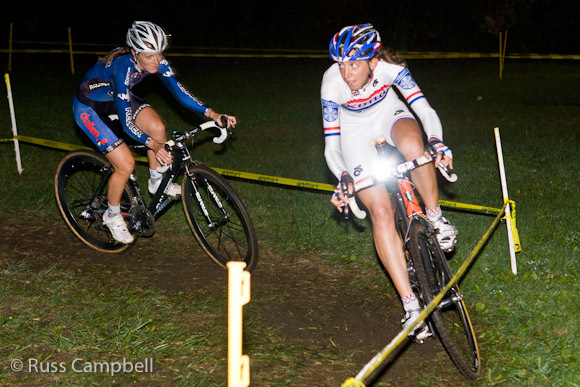 With headlight on, Helen Wyman leads Gabby Day through the darkness. 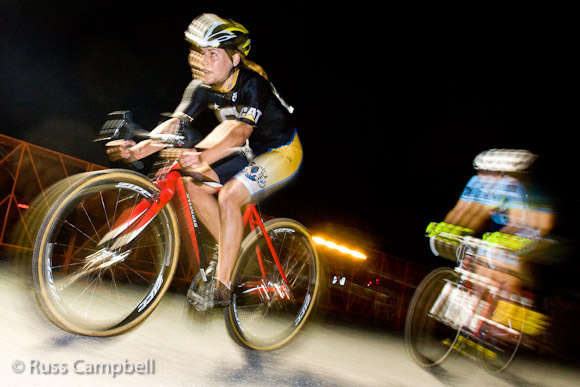 The evening’s slate of races consisted of four heats: a Mens’ 3/4, the Zanconado Single Speed race (men & women), a Women’s Open P1234 and the Elite Men’s P123. Each race began on the hour with the first at 5pm. The lights went on just before the start of the women’s race and gave the Fairgrounds an eerie look. 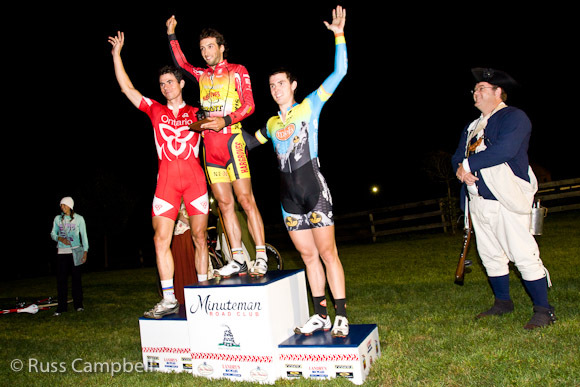 This was the first race that featured the new Minuteman Road Club podium, built by members Scott Sweeney and Russ Campbell then expertly painted by Ian Rusk. 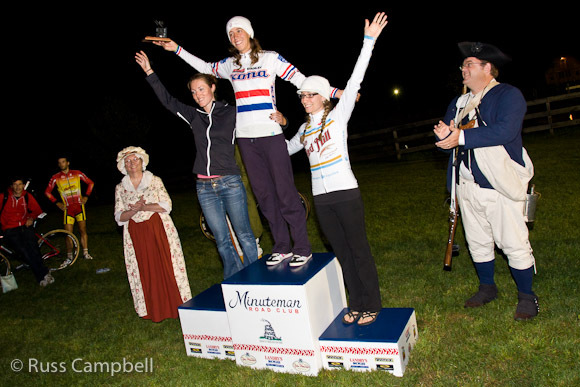 Members of the Stow Minutemen lent a historically thematic presence for the trophy presentations. 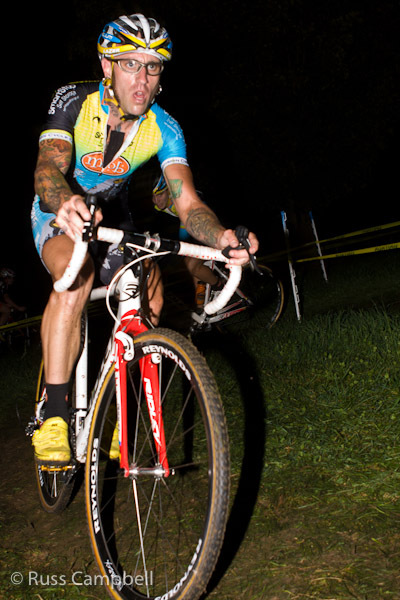 Mike Garrigan had an early lead on eventual winner, Ian Field. Adam Meyerson navigates the diabolical off-camber switchbacks. A good number of volunteers stayed after the race and made quick work of course breakdown and clean up, we are very grateful for your effort! 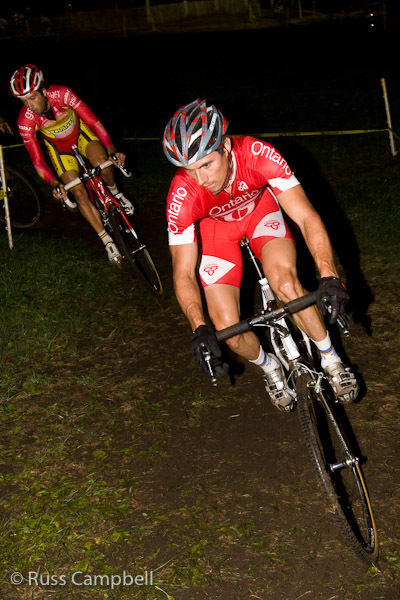 You can read the press release that gives a race report for the two elite fields at the Midnight Ride of Cyclocross website and read race reports by MRC club members in our public forum. The complete results are viewable on BikeReg.com.